This image was the inspiration for this article. 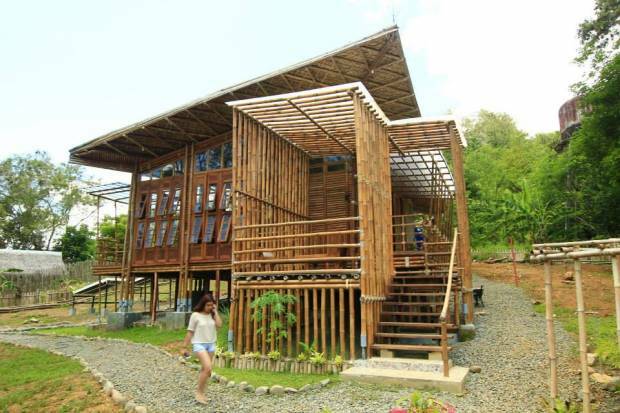 This is a Bamboo House in Palawan at the Palawan Council for Sustainable Development. A model unit for the Zero Carbon Resort, this was a result from of the winning design participated by architects from Green Architecture Advocacy Philippines. Living in a tropical country has its pros and cons. We have extreme heat and humidity and strong winds especially during the peak of the monsoon seasons. Our architecture has to deal with these types of extreme conditions too. Passive Cooling is harnessing these types of energy to work for the house by means of design and construction methodologies rather than using energy from artificial appliances. The Bahay Kubo exemplifies this through the presence of wide windows from strategic locations of the house for natural ventilation. Other fenestrations that allow wind to flow through the house are over-sized windows, ventanillas or louvers, and an exhaust route for hot air at the top of the ceiling to name a few. Furthermore, wide eaves and overhangs provide shading for the entire house as well as its surroundings. Proper orientation of the house to open up to the wind directions (Amihan and Habagat) may also be helpful when site allows. When this is achieved, heat is deflected away from the house but light is still welcomed. The same principles can be applied to a modern house and I promise you, you will also get the same wind flow and heat protection. Conditions in the Philippines also range from rainy and sunny. Lifting up the house on stilts is also beneficial not only to allow wind to enter and circulate from under the house but also to protect the house from floods. In the case of the Modern Bahay Kubo, if the house is raised on stilts, the lower floor acts as a social space for family and friends to come together forming an interstitial space. In the older times, this space also served as the extension of the family space or a storage for livestock or harvest. Moreover, a house on stilts also reduces the building foot print and has a very minimal ground disturbance during construction. Building materials also play an important role in the construction of a bahay kubo. These include bamboo, sawali, anahaw, rattan, among others. Bamboo is actually a type of grass with utmost strength and flexibility. It is also one of the fastest growing plants in the world, hence its sustainability. A typical Bahay Kubo is 80-90% bamboo. The leaves act as cladding for the ceiling and the roof. Concrete may also be used but only recommended for the foundations of the house and so that insects are not able to eat into the house’s foundations. Today, the Modern bahay kubo uses more modern materials that are still sustainable and environment friendly. Certain materials are also certified to be sustainable as they are eco-friendly or made from recycled products, or those with low volatile compounds, etc. A unique trait amongst Filipinos is that we consider the family as a single social unit rather than an individual as one unit. The family plays an important role in Filipino society. This is something designers and planners must never forget. The spaces inside the typical bahay kubo are limited but big enough to accommodate a whole family living together. The social space adapts to the Filipino family values of being together and sharing their lives with one another. The idea of a family as a single unit dictates that the common spaces of the house are bigger than i.e. their rooms. Usually, the bigger rooms are the dining areas (Filipinos consider eating as a hobby and a past time) or Family areas. This is also evident in the “Modern Bahay Kubo”. Filipinos love to entertain and have friends and extended families over thus, spaces have to be designed to accommodate large or small groups and spaces have to be able to open up to each other. One might notice that the dining room opens up to the living area and the living area may open up to the garden or an outdoor patio. Heck, in a traditional bahay kubo, the community lives so close to each other that they share their big common space with their neighbors opening the house not only to their family, but also to the community. That’s is how social Filipinos can get. There are still a lot more principles I can extract from a small bahay kubo but I will stop here and leave the rest to the imagination. The Bahay Kubo is not just a ‘small’ house, it is a home, that is full of history and in it lives the heart of the family. It is very functional given the limited material choices in the provinces but with the right choice of materials and the right construction methodology, the bahay kubo can withstand the strong storms and remain standing. Its elements are sustainable and its principles are still extracted, studied and translated into modern day thinking. “Bahay Kubo, kahit munti, ang halaman doon ay sari-sari’” (Even if the bahay kubo is small,) it is still used for so many purposes with each space designed and well-thought of. The concept of the bahay kubo will never die, it is just transformed into something modern perhaps due to the rise of more modern materials but its soul will always be there in the hearts and minds of each and every Filipino – young or old. Should i have the floor plan of this builings and also the elavation? Should i have the floor plan and elevation? are you selling the floor plan for this bamboo house? What chemical do we have to apply to fresh cut bamboo as a preservative or deterrent to pest….that can hopefully last more than 10 years ? And the procedure of application is also a must. Mostly we will use on our housing and furniture projects. We will appreciate any sound advise sir / mam. Borax po. Google nyo na lang paano.